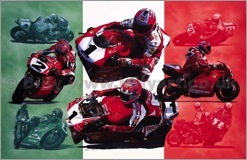 Limited Edition of 200 signed by Carl Fogarty MBE and Billy. Foggy also won the 2014 ITVs "I'm a Celebrity Get Me Out of Here!" reality TV programme hosted by Ant and Dec. Signed by Carl Fogarty MBE, 7 times World Champion and Billy. 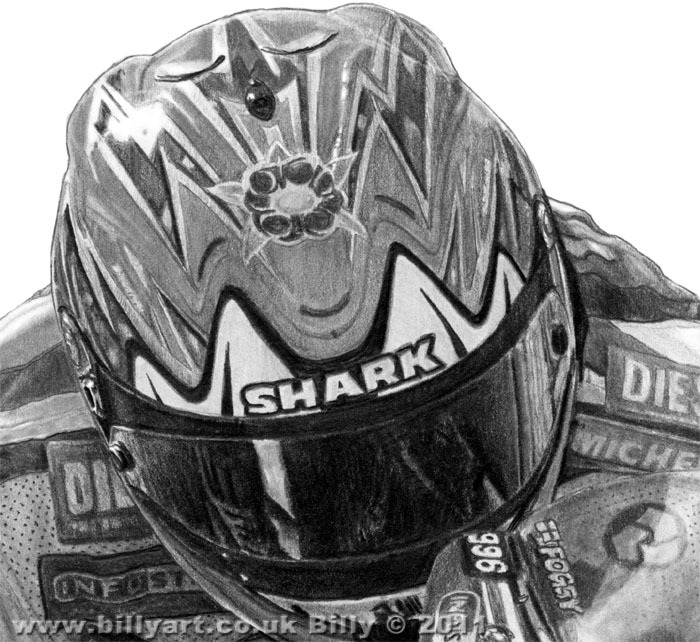 This is a brand new limited edition print of Carl Fogarty for 2011 that was a mutual collaboration between Foggy and Billy. To the right you can see Carl signing the 'Foggy' prints. 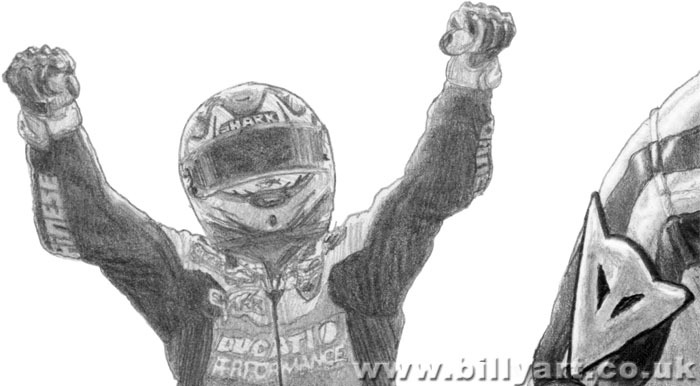 The original drawing of Carl Fogarty was a joy for Billy to work on and was produced over a couple of months. 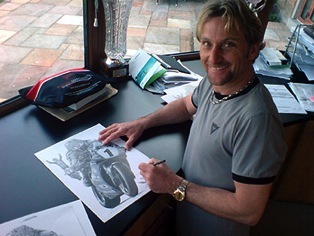 There are photos of the art work of Carl Fogarty in progress on Billy the artist's facebook page. Carl Fogarty's famous shark helmet with the Lancashire Rose focused behind the bubble of the Ducati 996 on his way to another World Superbike Podium. Lovely contrast of the organic leather of Carl Fogarty's glove against the the technical engineering of the handlebar and brake assembly, behind the fairing that has Foggy's "eyes" and the victors number 1 plate. The side panel of Carl Fogarty's Ducati World Superbike. 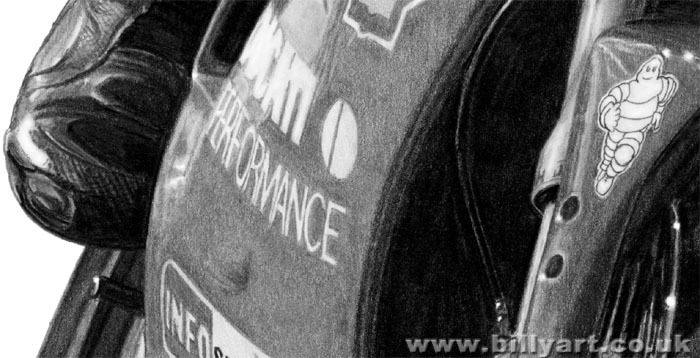 This oversize detail shows the contrast between the leather of Carl Fogarty's boot, the plastic of the Ducati fairing with the logos and the metal of the brake disc and hose. Carl Fogarty victory pose. The background detail oversize. 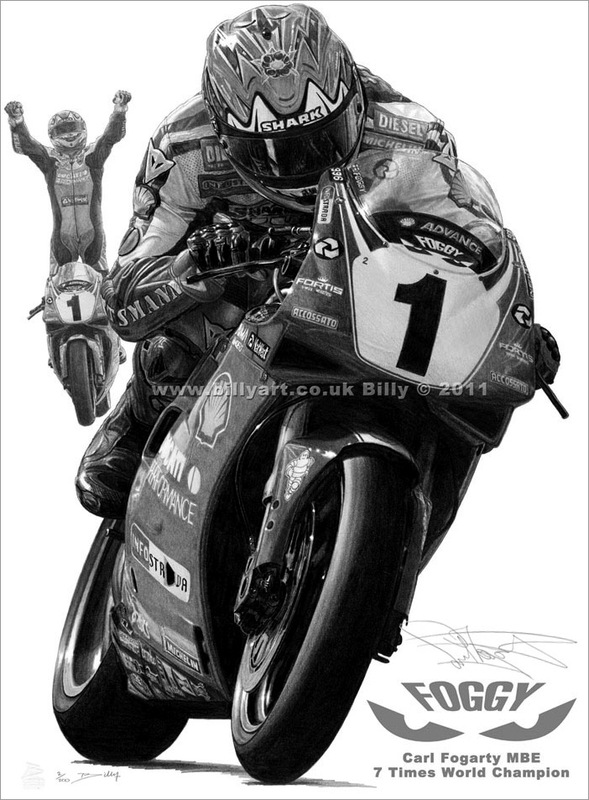 'Foggy' by Billy is a unique Carl Fogarty fan collectors print that would make a great motorcycle gift.